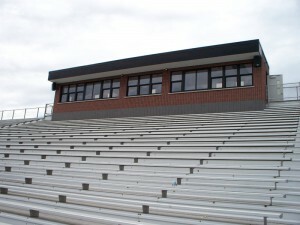 When administrators of Hatboro-Horsham High School in suburban Philadelphia approached Omega Electronics about replacing their stadium P.A. system, they were looking for a substantial upgrade. Their current system consisted of a pair of aging public address horns, plagued by unintelligible voice reproduction and low-fidelity musical output. What they wanted instead was a system with the fidelity and response of a home audio setup. Torquato and his team set up the new system – a Technomad Turnkey PA System – in under four hours. They installed the Noho waterproof speakers on the press box façade following masonry work to smooth the textured brick surface for the mounts. The weatherproof design of the loudspeakers mean that they can remain unprotected from the elements year-round. The Nohos are wired to a rolling signal processing rack inside the press box. The Technomad Turnkey PA system rack comes complete with a pre-wired amplifier and a six-channel mixer with front-panel iPod/mp3 inputs, as well as a hard-wired microphone.